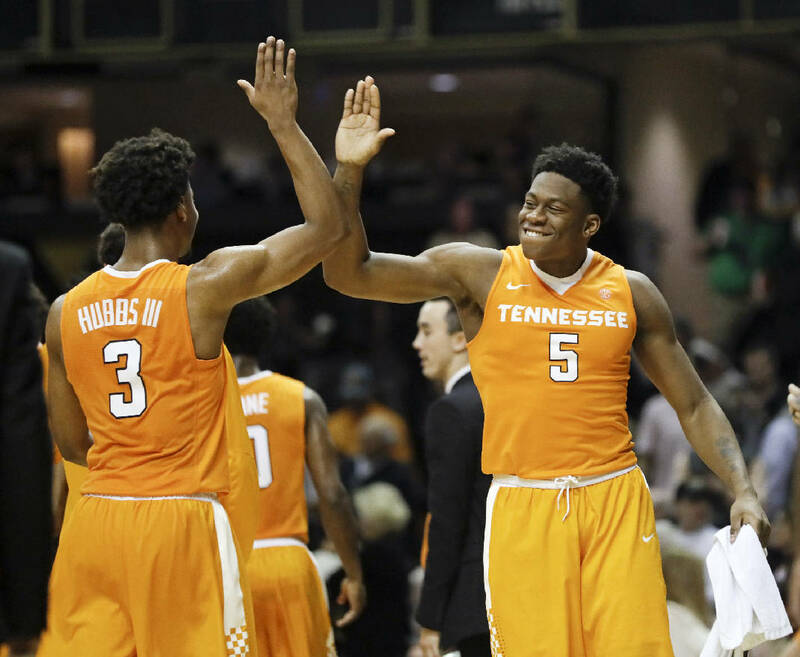 Failing to build on the momentum of Saturday's win at Vanderbilt, Tennessee coughed up a 13-point second-half lead in an 80-69 SEC loss at Mississippi on Tuesday night. The Rebels, who had lost four of five to open league play, led by as many as 11 points in the first half, but the Vols (9-9, 2-4) overcame a slow start to close the half on a 7-0 spurt and tie the game at 38 going into halftime. 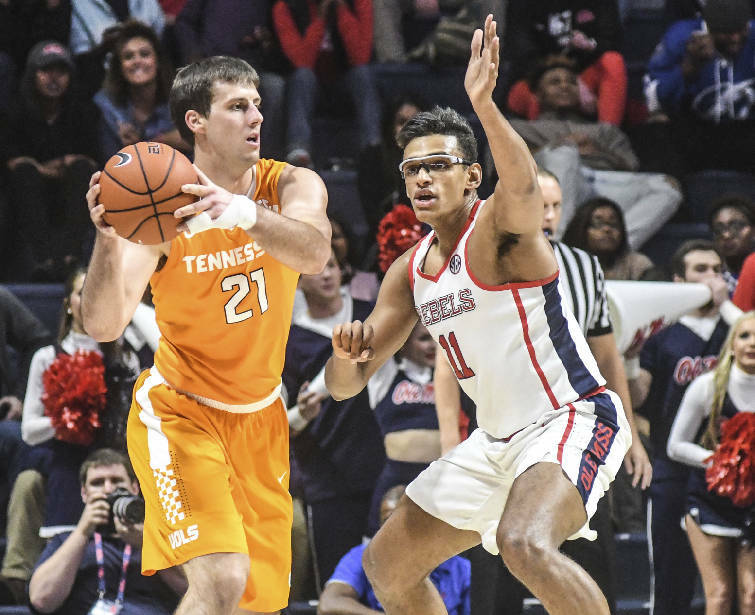 Tennessee then opened the second half on a 14-1 run to take a 52-39 lead but was unable to maintain the intensity and mustered no response to a desperation run by Ole Miss. The Rebels (11-7, 2-4) came to life with a 13-2 run and took the lead for good on a fastbreak layup by Terence Davis with 6:48 remaining. The Vols shot 3-of-21 from the field in the final 11-plus minutes and didn't make a field goal in the final 4:13, while also missing 11 free throws. Ole Miss shot 50 percent in the second half and benefited from a 42-24 advantage in free-throw attempts. Robert Hubbs III and Lamonte Turner scored 15 points apiece to lead Tennessee, while Davis (20 points, 11 rebounds) and Sebastian Saiz (17 and 10) both double-doubled for Ole Miss. KNOXVILLE — It's taken nearly half the college basketball season, but Tennessee finally is getting the version of Admiral Schofield it expected to have. The sophomore forward continued his resurgence with 15 points on 7-of-11 shooting off the bench in Saturday's win at Vanderbilt, and entering Tuesday night's game at Ole Miss, Schofield was scoring 9.8 points per game in Southeastern Conference play after averaging just 3.5 prior to league play. "What he's doing now is what we want and expect," coach Rick Barnes said Monday. "Actually, I think there's much more there for him to get to as he continues to grow and develop. Starting or coming off the bench, I don't think it really matters to him, but I do like that we can go to our bench and bring what he brings. "Lamonte (Turner) played really well Saturday. I don't think the starting part is anything I put a lot into. Admiral really in the last three weeks has just been really engaged. He's been focused. He's been poised and simplified what he's trying to get done and what we need him to get done." Schofield had a promising finish to his freshman season with the Volunteers. He started 22 games and scored at least 10 points in each of the final six. He averaged 7.6 points per game and 8.5 in SEC games. He was scoreless in 13 minutes in Tennessee's season-opening loss to U- Chattanooga and missed three games while he was suspended for violating team rules. Before Tennessee's 87-75 win at Vanderbilt on Saturday, Schofield chalked up the suspension to immaturity and misplaced priorities. "I think the biggest thing was when you're on this campus, sometimes you can let the surrounding atmosphere get to you, and that's an immaturity factor," he explained. "I had to realize that and grow up in that issue, but I think that right now I'm pretty focused and I realize who I truly am. "I think the biggest thing right now is just continuing every day to work hard and come in and be an example for these guys." Schofield played just seven minutes in Tennessee's road wins at East Tennessee State and Texas A&M, but in the following four games he averaged 11.3 points and 5.3 rebounds. The breakout performance was his first career double-double (18 points, 10 rebounds) in the loss at Florida. Schofield credited the humbling experience the suspension provided for getting him back on track. "I really needed that time to really refocus on what's important and really simplify the things that I needed to really focus on in my life," he said. "It really showed me that a lot of things I had going on wasn't that important. The people I was around or the things I was doing just wasn't important at the time. "It took me away from the game and the love of the game, and I just had to get back to loving the game like I do and working as hard as I do." Schofield's turnaround is vital for Tennessee in the wake of freshman John Fulkerson's likely season-ending injury and the abrupt dismissal of Detrick Mostella, particularly with so much of the season still left. "He's not afraid to speak up and help coach the team," Barnes said. "That's going to be the next step, if we can get consistent with those guys having a voice amongst themselves that they hold each other at a high level of accountability. Admiral's not afraid to do that, but he's doing what we need him to know. "I would say this about all of our guys, he's just got to continue to do it and get better at it."